When we read the Scriptures we will often reflect on the accounts that we find, of the life of our Lord Jesus, and the Apostles, and other important figures. But unless our thoughts are moulded by the writings and teachings of the Orthodox Church, through the commentary and explanations of the Fathers of the Church, there is always the possibility that our reflections will lead us astray. There is no guarantee that every opinion and conclusion we come to is correct. When we read the Scriptures as Orthodox Christians we are to do so with the Bible in one hand, and the teachings of the Fathers in the other, because the Scriptures were written in and for the Church, and not for personal interpretation. Indeed, the idea that the Bible can simply be read and understood by every person as seems right to them is the essence of the error that led to the fragmentation of the Church in the West. Nor can we say that every idea we have is of the Holy Spirit, since our Lord Jesus Christ promised that the Holy Spirit would lead the Apostles and the Church into truth, and did not promise that the Holy Spirit would validate every personal interpretation of Scripture which came to our mind. In almost every human endeavour, it is necessary to train, and commit ourselves to learning and understanding all of the subject matter that has already been developed. It is not possible to decide that we will be a lawyer, and begin practicing the next day. Or to decide we will be a craftsman in wood, and begin nailing pieces of timber together immediately with any prospect of success. Nor should we imagine that we can understand the riches of the Orthodox Christian life, and the Orthodox and Apostolic understanding of Scripture if we do not subject ourselves to learning and training in the same way. 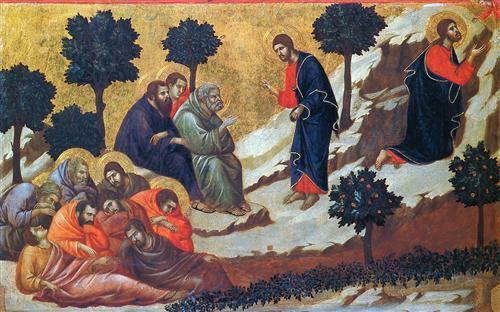 The account of the Lord Jesus in Gethsemane is an example of a passage of Scripture that it is easy to develop reflections about, but which might not be understood in the same way as the Church at all. We find the time of prayer spent in the Garden of Gethsemane recorded in Matthew 26, Mark 14, and Luke 22. Many of the Fathers have left us commentary and exposition on these passages. In fact much of the writings of the early Fathers is concerned with a proper understanding of Scripture above all else. This is not the view that most modern commentators would take. They would stress the human elements in the account, the natural anxiety and even fear in the face of death. But this was not the ancient understanding as we shall see, and such a view tended to develop from a rather Nestorian understanding of Christ as being essentially just a man, dealing with the cross as a man, and from the modern attempt to make Jesus no more than a teacher and preacher. In this commentary we see that the concern is to show that Christ is always concerned for others, for his disciples, knowing that they would be scattered and that their faith would be shaken. He is not a terminally ill patient, crying out in pain, but he is like the patient whose concern is always for the condition of those who are visiting and gathered around his bedside, even to the last breath. Again we see that St Hilary wishes to exclude any thought that the Lord Jesus Christ is fearful for himself. Rather his concern is for his disciples, for others, just as on the cross he asks the Father to forgive those who have crucified him. It is necessary to insist that Jesus Christ was truly sorrowful, and that this was an expression and manifestation of the reality of his human nature. But once again, we see that he is not to be understood as feeling sorrowful for himself or for fear of the suffering to come, but because of the falling way of Judas, and the other Apostles, and the complete falling away of the Jewish people. It is undoubtedly the case that Jesus Christ speaks as a man, but St John Chrysostom does not press the point to suggest that Christ is burdened with fear for himself when he speaks in such a way. He speaks in such a way to manifest his humanity and his divinity. It is not from fear that he asks his, but as an expression of his own humanity in the face of a trial which will put his humanity, not his own personal will and decision, but his humanity to the test, as it would test all flesh. There are those who wish to so elevate the sense of a human Christ that they describe a great conflict of will between the human Jesus and the divine Word. But this is to create two subjects and two persons. Orthodoxy rejects this and finds a complete harmony in Christ, the Word made flesh. The humanity has the same will as the divinity, and the same one wills in both in the same way. What is Origen insisting on in this commentary? It is that the humanity is truly human, not a mask or a pretence. But that Christ is also beyond our understanding. He was truly troubled, and he appeared as a man, but he is not just a man, and we are mistaken when we interpret him just as a man. He insists here, as previously, that his death is not the cause of his entirely human sadness at all, nor is it that which troubles him, though he truly allows his humanity to be troubled. When our Lord Jesus sleeps, it is because he has taken on our human existence in a true way. When he hungers, it is because he has taken on our human existence in a true way. But he is never limited or bound by our humanity. He is truly human but not only human. When he fasted for forty days and forty nights, the Fathers teach us according to the Scriptures, that it was only at the end of that period that he allowed his humanity to feel natural hunger. This was not a pretence of humanity, but the Word of God uses his humanity for a purpose, and is not limited by it. In the same way, he was baptised for us, not as though he needed to be baptised. And here, in this passage, he speaks on our behalf, as one of us, and not as if he was ignorant of the will of God. He speaks here as man, and will suffer and die as man. But he is not only a man. When he shows the weakness of humanity he is not bound by it, because he is not merely a man. Nor does this natural weakness dominate him, for he is not afraid of the suffering to come. But he allows this natural reticence to be manifested for a moment, because it is a blameless passion, such as feeling tired or hungry, and to show that he is truly human, while not allowing it to control or direct him at all, for he is the Word of God made flesh, and not a mere man. In the same way, the bravest of men might hesitate before plunging his hand into a fire to rescue a child, not because he hesitates in what to do, but because of the natural and blameless reticence of the flesh before pain and hurt. There was no doubt in Christ about what he would do, but he allowed his true humanity to experience and manifest that natural reticence. We find here that Ephraim is clear that Christ truly experienced aspects of the humanity in the face of death, just as he had truly allowed his humanity to experience natural passions of tiredness and hunger when he chose to do so. In such a manner he allowed his humanity to experience the anguish of death, the natural and blameless resistance to death which is inherent in it. But we are clearly to understand that the Word of God was always in control of his own humanity so that he is said to have given his body what belonged to it, just as he was able to elevate his own body above nature while it remained entirely human. There is a great difference between the anguish of death experienced by the body as the Word willed for a time, and the anguish of death penetrating the heart and overcoming a person in despair and fear. If he felt the resistance to death which is natural to us and blameless, then it did not overcome him, and cannot be imagined as being experienced exactly as we might. It was truly experienced in a human way in his humanity, but he is not only or merely human, and it was experienced for a purpose in the Word of God incarnate, and not as it is with us, by necessity. In him, it was to show the reality of his humanity and to embrace all of death as he prepared to destroy it. Nor was he ever subject to that fear of unknown circumstances and outcomes, but it was the natural and blameless reticence and resistance in the face of death with which we are created. Just as his hunger was not gluttony, nor was his tiredness any sort of laziness, so his experience of anguish before death was blameless and was not that fear which is a lack of courage and faith. We might read this as a request that Christ not go through the trial that is to come. But St Hilary does not understand it in this way at all. It is not that Christ wishes that someone else could face it instead of him, or that it not be required at all. It is rather that in the experience of natural human reticence before death (and in our own experience as human persons we recognise that there is a difference between a state of aroused awareness of risk and danger which is fear, and the mental condition of being fearful which is a psychological and spiritual dysfunction) Christ chooses to embrace the cup and asks for the strength to consume it even in the experience of natural human fear. St Hilary has already explained that he does not believe that Christ was afraid of death, in the sense of a definite psychological attitude, but he certainly allowed his humanity to experience as far as he willed, the natural fear of death, which is not the same. When I was on top of the CN Tower in Toronto I could not make my legs walk onto the glass floor hundreds of metres above the ground. My body was expressing forcefully the fear of death, but I was not actually psychologically afraid at all. I wanted to walk onto the glass, and I knew it would not break. But some aspect of my humanity was resisting. Yes, He says, not unbefittingly am I found thus in anguish. For I know indeed that by consenting to suffer the passion upon the cross, I shall deliver all beneath the heaven from every evil, and be the cause of unending blessings to the inhabitants of the whole earth. I am not unaware of the unloosing of death, and the abolition of corporeal corruption, and the overthrow of the tyranny of the devil, and the remission of sin. But all the same it grieves Me for Israel the firstborn, that henceforth He is not even among the servants. … And tell me then, what husbandman, when his vineyard is desert and waste, will feel no anguish for it? What shepherd would be so harsh and stern as, when his flock was perishing, to suffer nothing on its account? These are the causes of My grief: for these things I am sorrowful. For I am God, gentle, and that loves to spare. “I have no pleasure in the death of a sinner, but rather that he should turn from his evil way and live.” Right therefore is it, most right, that as being good and merciful, I should not only be glad at what is joyful, but also should feel sorrow at whatsoever is grievous. St Cyril wishes us to understand, as other Fathers referenced previously have also stated, that he was not in anguish for himself, though he truly allowed himself to feel human grief. But it was for others, and especially the people of Israel who would no longer be his own people, and who would be found to have rejected him, and bear the consequences of that rejection. But this anguish, which Christ appear to truly experience for us, and not as if it was a necessity, what does St Cyril say of this? It is important that we understand that God the Word willed, or chose, that his own humanity should experience even grief and anguish. And he really experienced these, in a human way, but not like us, because his humanity was not limited in the way that ours is. It was necessary that he experience anguish at this time, as the other Fathers have also said, to make clear that he was truly human and had the same possibility of experiencing the blameless passions which are inherent to our humanity. But these real feelings of anguish are not due to a fear of death according to the will but because of the consequences of the passion for the Jews, and according to others we have considered, because of the instability of the disciples, and even the falling away of Judas. We too easily assume that none of these things matter very much. But for the Fathers, the love which God had for Israel, for his disciples and even for Judas, were enough to move him deeply for their sake and not for himself. It is a continuing theme of St Cyril, following St Athanasius, that the Lord Jesus became incarnate for a purpose. He willed to retrace the steps which Adam had taken in falling into sin, and restore mankind by a recapitulation. And so in many places throughout the life of Christ we see him acting and speaking in a way that makes no sense for God made man, but makes every sense if he is retracing Adam’s steps. There was no need for him to be baptised, for instance, but he was baptised on our behalf. There was no need for him to overcome temptation in the wilderness, but he did it on our behalf. There is no need for him to say, your will be done, but he says it on our behalf as Adam had proven disobedient in the past. He is not a mere man trying to make sense of events, but he is God the Word who has become man for a definite purpose. There are two important things here. In the first place we see that St Cyril wants to insist that it was because of the Jews that he asks if there is another way. But in the second place he already willed with the Father the passion, the death and the resurrection. There was never any contradiction, but the Word of God truly allowed his humanity to express in a human way the feelings he had towards the Jews and others. Once again there is a focus on the others who will be affected by the drinking of the cup, rather than it being spoken in personal fear of death, though we can also accept the view which other Fathers have expressed here that there was a natural and blameless resistance before the prospect of suffering and death. Here we can see that the blameless passion of fear before suffering was present in a true manner in Christ. To know what is to come and to face it is not to be without that natural fear which he allowed his humanity to feel. But it was not that unmanly and cowardly fear that makes a person hide and become incapacitated. It was the natural fear which soldiers waiting in the trenches in World War I would have felt before going over the top despite that fear. It was the natural fear which the martyrs felt even while bravely confessing Christ. It was not the fearfulness that led others to apostasise. The Lord Jesus did truly feel all the pain of the beatings and the crucifixion. It was natural to have anxiety about what was to come, and St Justin Martyr wants us to be clear that he did allow his humanity to have anxiety about this, but it was not overwhelming even though it was real human experience. This seems to me to express that sense that everything Christ did was for a purpose and for our salvation. It was not that he was preoccupied with his own situation, though he certainly felt a natural and blameless anxiety in the face of what was to come. But he was moved to sadness for the sake of others. He spoke as a man to undo what Adam had lost, and in speaking as a man he allowed himself to be moved as a man. But he was not afraid of death, even though he allowed his body to be moved by the natural resistance to death. He was more concerned for the disciples, the Jews, Jerusalem and even Judas. He did not struggle within himself. That is Nestorianism, and sets up a human Jesus in conflict with a divine Word of God. He is not a mere man, but he is the Word of God made man while remaining who he is. Every action and word is performed and spoken for our salvation. Even these passages show a range of emphases but together they set the boundary to what we should think and reflect on this subject. We do not find a helpless and despairing Christ. We do not find a Christ overcome with fearfulness. We do not find a Christ filled only with concern for himself. We find something much more complex, and not easily made black or white, but something much more powerful and inspiring.